This webinar has already occurred. View the video screencast below. This webinar will focus on possible ways to scale up from classroom use of InTeGrate modules at two-year-colleges (2YCs) to thinking on a larger, program-level scale. The InTeGrate website describes these opportunities as "Implementation Programs". 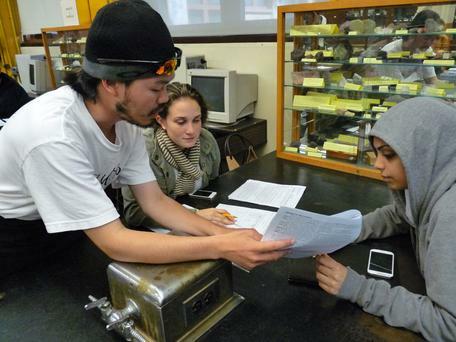 Institutions, or clusters of institutions, are invited to apply for grants of up to $50,000 to develop and evaluate programs that model innovative ways of 1) increasing the number and diversity of students developing Earth literacy and/or 2) preparing a diverse workforce equipped to bring geosciences to bear in addressing societal issues. This webinar will be a place to learn more about these opportunities and hear from some 2YC groups that are doing innovative things in a similar vein. Participants will have the opportunity to ask the presenters questions and discuss implementation program options. Click to watch the screencast. 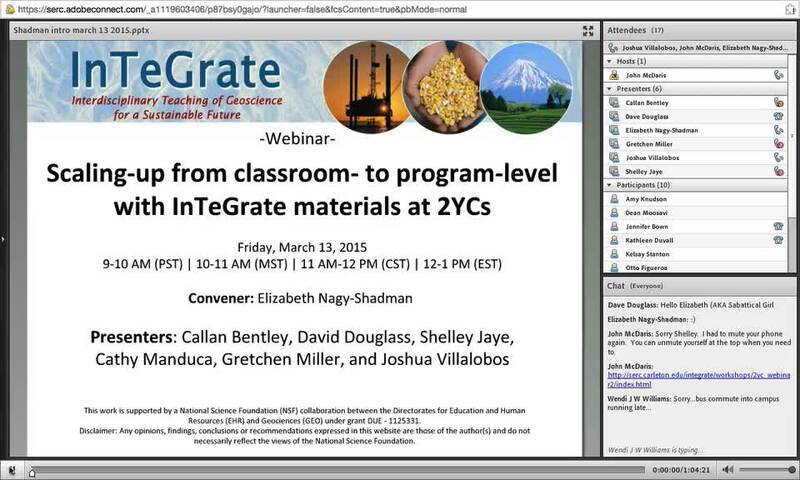 Encourage 2YC faculty to adopt InTeGrate modules at a scale that is larger than a single course. Present InTeGrate implementation program opportunities to 2YC faculty. Showcase current 2YC programs that have moved beyond an individual classroom of change (not necessarily using InTeGrate materials). Allow participants to ask questions about possible implementation programs involving their own college. Format: Online web presentation via Adobe Connect web conference software with questions and discussion. Participants will receive an email with instructions detailing how to log into the event after the registration period has closed. Participation requires an internet connected computer and a phone line. For additional information on the format, see the Technology page.